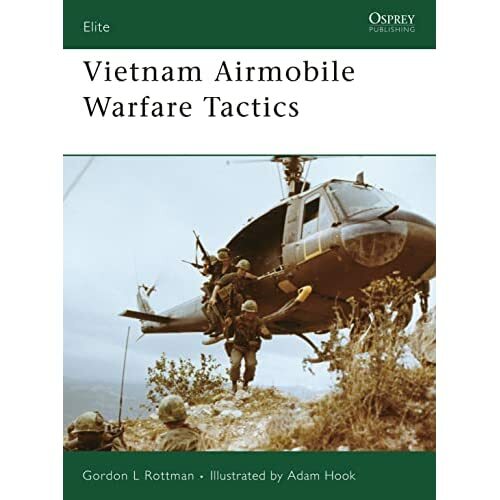 Written by Gordon L. Rothman and illustrated by Adam Hook, this book is a great reference to modeling and anyone interested in the Vietnam War and Airmobile Operations in it. The book is # 154 in Osprey's Elite series and hold up to their usual excellent quality. It is comprised of 64 8 inch by 10 inch glossy pages and hundreds of black and white photos. It also has the Osprey standard of 8 center pages with color plates that show aircraft markings in detail and full-color maps to better illustrate some of the major battles. The book begins with a description of helicopters and their development leading up to and their use in the Vietnam War. It starts with the some of the early models such as the CH-21 "Flying Banana" and then on to the Huey, Cobra, Chinook, Cayuse, etc... Also included are Marine Corps helicopters. Next comes a short description of some of the enemy ground threats that the helicopters faced in Vietnam. This section shows some of the weapons and training aids the Viet Cong used to defeat American helicopters on the battlefield. The first part also looks at various armament systems that were used as well. It covers the common systems used on Hueys and Cobras well, and touches briefly on the ACH-47A Chinook gunships as well. The next section of the book is a description of the development of Airmobility. It covers the initial concept as put forth by MG Gavin (82nd ABN commander in WWII) in a 1954 article entitled "Cavalry, and I Don't Mean Horses!" and the initial "Sky-Cav" platoon that tested the concept at Ft Benning, GA, to the Rogers and Howe Board on helicopter requirements for the US Army. It also looks at the 11th Air Assault Division, later to become the 1st Air Cavalry, and their work on initial airmobile tactics. The next section is the meat of the book. It covers Airmobile Unit's Operations in Vietnam. Both Army and Marine units and aircraft are discussed in great detail. The tactics and how they were used in different battles is also detailed. Organizational charts and orders of battle are also shown to understand how the units were organized and the aircraft assigned to them as well. The last section discusses different missions performed by airmobile units. These include MedEvac, Air Assault, Aerial Attack, and gunship tactics. Each of these missions is explained in detail. They are broken down into planning, preparation, and execution. Great detail is given to convey to the reader exactly how each was conducted. Highs: It has great color and black & white prints and illustrations. Well detailed and an easy read. Verdict: Overall, this is a great book to add to your reference collection. I highly recommend it to modelers or history buffs interested in the Vietnam War. Thanks for getting it posted Ted.